This compact adapter fits all common seat posts, so that you can enjoy all Contour bag advantages even on bikes without carrier. 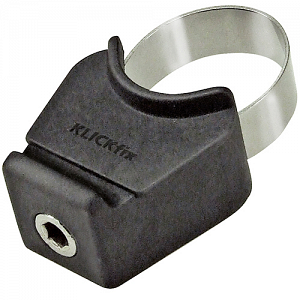 With just one click, the bag or the CATCHup mudguard automatically locks into the adapter. Press the red button to release. Comes with two clamps for Ø 25-28 and for Ø 28-32mm. Because the release button is located on each bag's frame, the adapter is hardly noticeable when you ride without the bag. We don‘t advise the use on carbon- or other lightweight seat posts or recommend to take advice from the manufacturer.